This post concerns Eocernina hannibali (Dickerson, 1914), an Eocene shallow-marine gastropod (snail) commonly found in silty sandstone beds. It ranges from northwestern Washington State, coastal Oregon, all through coastal California, to the eastern Laguna San Ignacio area in Baja California Sur, Mexico. This gastropod is an index fossil (i.e., indicative of) the early and middle Eocene (approximately 55 to 40 million years ago). Eocernina hannibali is a medium to large-size species. The above picture on the left is the apertural or front view of an adult specimen (65 mm height, 53.1 mm width) of E. hannibali. 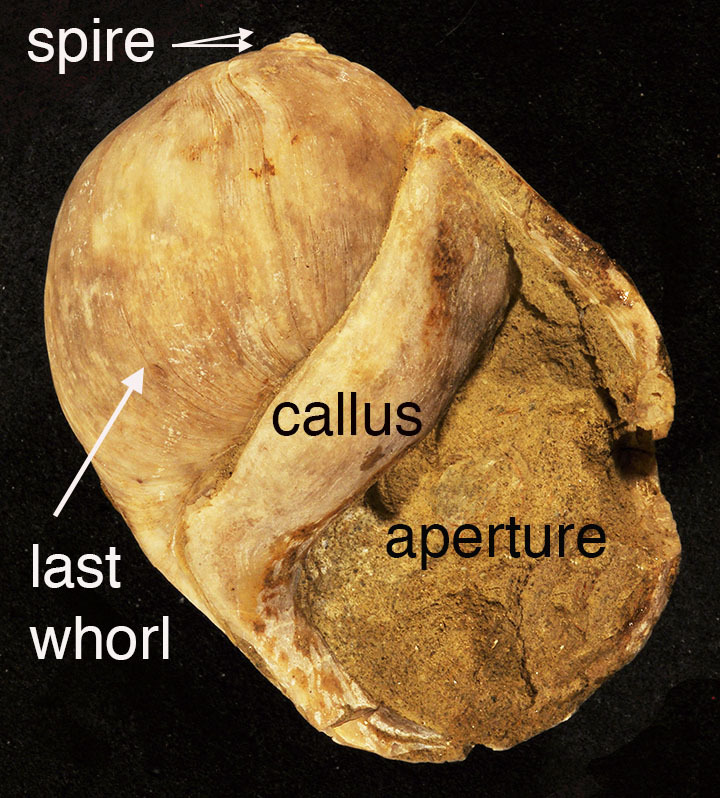 The picture on the above right is the abapertural or back view of the same specimen. This specimen is representative of the larger individuals known for this species. Growth lines are especially apparent on the back side. Eocernina hannibali is characterized by having a globose, smooth shell consisting a large last whorl (which contained the living animal), a rather tiny spire (or tip), and a wide smooth band (callus) adjacent to the opening (aperture) of the shell. The aperture becomes filled with sand during burial. of E. hannibali shown above. Locally, if the ancient environment was favorable, there will be many hundreds of specimens of this gastropod at a single locality, with sizes ranging from juveniles to late-stage adults. At these particular localities, specimens of E. hannibali are complete and so common that collecting them resembles "plucking small potatoes out of a bag." Dickerson originally put the species in family Naticidae and genus Natica. Recent naticids, which are diverse, are known to be carnivores that drill holes in other shells in order to reach the tissue of their prey. Modern work shows that E. hannibali belongs in family Ampullinidae, a nearly extinct family whose recent members are herbivores that eat algae. This familial assignment is logical because E. hannibali can be extremely abundant. If it were a predatory snail, normally it would be rare to uncommon in fossil beds. The classification of ampullinids, like many other fossil mollusks (e.g., snails and clams) is in a state of flux. To add to this confusion is that Eocernina resembles several other similar looking extinct and recent genera and species, thereby making positive generic identification a challenge. A meticulous comparative study of all these "look-alikes" is much needed.